In this day and age of exit polls and populartity projections - time for one related to the top architecture blogs out there. A L+U favorite is Eikongraphia, has a great, semi-scientific method for determining the popularity of focused blogs out therer. It's not mistake that certain blogs have extremely high readership and popularity is by being inclusive of a number of topics. And one with perhaps the broadest range is BLDGBLOG. There are definitely some I don't read often - and it's a great opportunity to add and augment my reading - based on my recent dissatisfaction with a number of the blogs that are more tangential than these. A few had dropped off my reading, such as Part IV and Subtopia, for lack of relevant content. Others I just don't really connect with what the directive is, such as Lebbeus Woods (love the drawings), Architectural Videos (not a fan of videos), and sit down man, you're a bloody tragedy (great band name though). 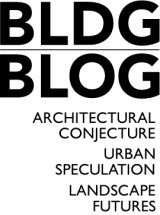 To classify a blog as 'Architectural' has it's own range of perils - as a hundred other topics are woven throughout the content of all of these - with perhaps the common thread as buildings. Ideas such as urbanism, sustainability, landscape, planning, design, materials, and on and on... For instance, Pruned is not a blog about architecture in any form, but is also not purely about landscape - which is part of the appeal. The Where is less about architecture than planning and urbanism - with forays into the realms of architecture where necessary. City of Sound for the most part is a lot of information from a very wide net, and the random bits I glean are gold, amidst clutter. Ditto for a number of the remainder of the list of 25 - the range of info is broad - which is indicative of the blurring of lines between all of these varied disciplines. Honestly, for all of my joy of some of these blogs, the are always hit or miss. BLDGBLOG for instance, is either so far into some abstraction that it's not relevant (to me) - and I skip it often. The next post blows me away with something amazing. So we keep reading. Additionally, there's a taste-factor. Writing styles, pretty pictures, heady dialogue, witty critique. We're all looking for that something that not only draws us in but keeps us coming back. It's always one of those 'how do I rate?' sort of reactions... but for the life of me I can't parse the system in a degree to be able to tell what is apples to apples. Either way, I'm happy with a Technorati rating of almost 50, and readership in the range of 300+ a day. And in the short time I've been posting and tracking, I've recently hit milestones of 20,000 visits and 50,000 page views, both of which blow me away. Anyway, I'm glad to see these lists, if purely for the opening up of some more resources for keeping this blog as well rounded - and well read, as possible. If Mr. van Raaij is willing to see how I rate, I'd love to see - but alas, I'm pretty happy with the three months of exponential growth - and the great feedback, commentary, and criticism. As always, any of the above is much welcome.